The now silent bell is shown in the interior of the First Presbyterian Church tower at 116 W. Court St.
Few persons in the community can remember the sound of the bell in the tower of First Presbyterian Church in Urbana. 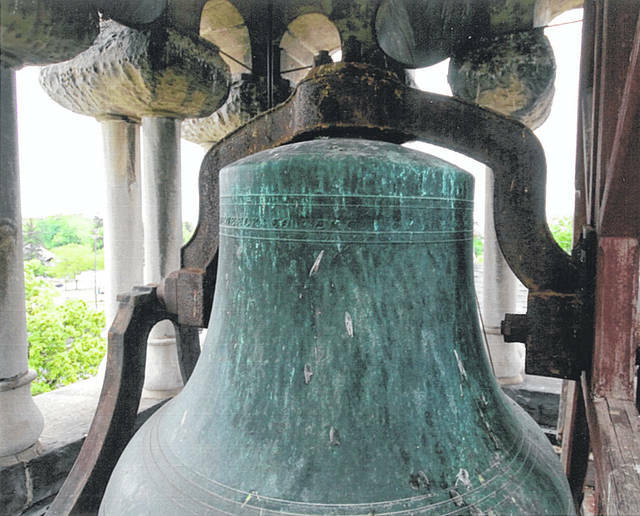 The bell has not rung for many years, as the structure and mechanisms have failed. As the local church endeavors to raise funds for repairs, it has enlisted the services of Jeffrey Crook, who is known internationally for his skills installing and repairing bell and chime systems. Crook will manually strike the bell on Sunday, April 7. Three opportunities to listen will be offered: a call to worship will sound at 10:15 a.m. Another strike will be made following the “Minute for Mission” during the service. Finally, after the choral benediction, the bell will sound for some time. Crook will remain in the church (after his descent from the tower) to answer questions, offer information and chat about the bell. The bell itself – a 2,000 pound Maneely bell – is as fine as the day in 1885 when it was cast. The Maneely Foundry Bells in that day were among the most prestigious in the United States. The congregation of the First Presbyterian Church (then in their church built in 1853) elected to purchase a bell for the steeple. When the present building was completed on the same site in 1894, the bell was moved to the tower. (One wonders how that was accomplished!) The bell, as in other churches, announced Sunday services and other occasions such as weddings and funerals. Later, after mechanization, its additional soundings were at 9, noon, 3 and 6 daily. Many persons checked their wrist watches as the rings reverberated throughout the area. However briefly the bell is heard on April 7, citizens may once again enjoy its resonant tone. Janet Ebert is a regular contributor to this newspaper.